Symbols of Valdez Municipality, whose capital is Guiria. It's located in the Eastern end of Peněnsula of Parěa on Sucre State, relatevely near Trinidad and Tobago. Would be convenient to mention that the Town of Macuro is part of its jurisdiction: first portion of American Continental ground that Columbus see on August 1st., 1498 during his Third Trip. 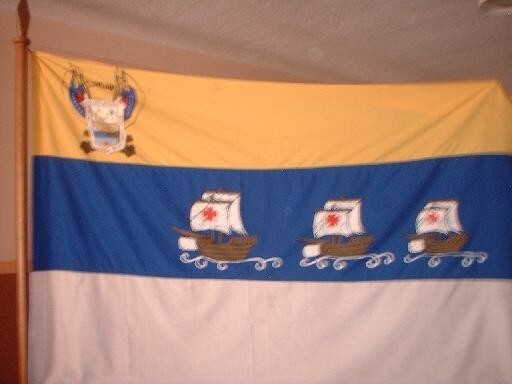 The Flag - Attributes and Semiology - The Valdez Municipality is located at the Northeast of the Sucre State and its capital is Güiria. Its flag consists of a field with approximated ratio 2:3 divided in three horizontal stripes of equal size: yellow (superior), blue (central) and white (inferior). Completes the design the Municipality Coat of Arms in the canton and three caravels on the blue stripe. The yellow symbolizes the magnificent sun of the Venezuelan Orient. The blue remember the waters of the Atlantic Ocean, which conduces Admiral Christopher Columbus to the harbor of Macuro on August 1st, 1498, jurisdiction of the Municipality that today have his name. The white symbolizes this hospitable "Grace Land": adjective which Columbus gave to this region, first portion of American ground that he saw. The Coat of Arms rebound the municipal gentilitious. The three caravels remember the so-called "Vachina", "Castilla" and "Correo": the Columbus boats which carry he to Venezuelan coasts. Historical Synthesis - Creation of Professor Eloina Bermúdez and design of Professor Violeta Rojas de Aguilera, it was approbated by the Municipal Council on November 5th, 1996. Sources: Material provided by Valdez Municipality Mayor Office on March 14th, 2003. Here is a photo of Valdéz Municipality Flag which I took when I was there. The Flag Reported in Website is incorrect if you confront it with the authentic flag. Same thing about the Coat of Arms. Not always the "official" images that appears on "official" sources are correct. Official website <valdez-sucre.gov.ve> report a different (incorrect?) flag. See Raul Orta's remarks above. The Coat of Arms - Attributes and Semiology - It's an English shape quartered per fess. The Chief or superior quarter enameled in Argent show a pineapple, two plants with fruits, two carrots, a banana tree at the dexter and a coconut tree at the sinister. The base or inferior quarter enameled in Sky Blue charge a sea with a nascent sun with six rays accompanied with a portion of land at the dexter, a boat at the sinister and a beach wit a fish on the base. Completes the design a border in Argent with the inscriptions: "REPUBLICA DE VENEZUELA" on the Chief; "ESTADO SUCRE" ("SUCRE STATE") at the dexter; "DISTRITO VALDEZ" ("VALDEZ DISTRICT") at the sinister and "GUIRIA FUNDADA EN 1767" (GUIRIA FOUNDED ON 1767") on the base. As external ornaments, the Coat of Arms shows the word "VALDEZ" with six rays from the Chief as crest; four Flags: two Venezuelan in first plane and two Valdesenians and two cannons crossed in saltire back the field as supports. The quarter of the Chief remember the fruits of the ground whilst the quarter of the base alludes to the ones of the sea, which in conjunction symbolizes the subsistence means of the inhabitants of the Municipality, whose ownership to the Republic and to Sucre State are rebound on the border with the foundation of its capital. The word "VALDEZ" remembers the eponymous of the Municipality: General JUAN MANUEL VALDEZ, hero of the Venezuelan Independence War native of the locality. The flags are tribute to the Great Homeland and the Little Fatherland. The cannons alludes to the courage of the inhabitants of the region. It's important to mention that this Coat of Arms was composed when the current Valdez Municipality was a District of the forward geopolitical division of Venezuela. Historical Synthesis - It was created on 1967 by the Chronicler of Güiria, Mr. ALBERTO BETANCOURT.